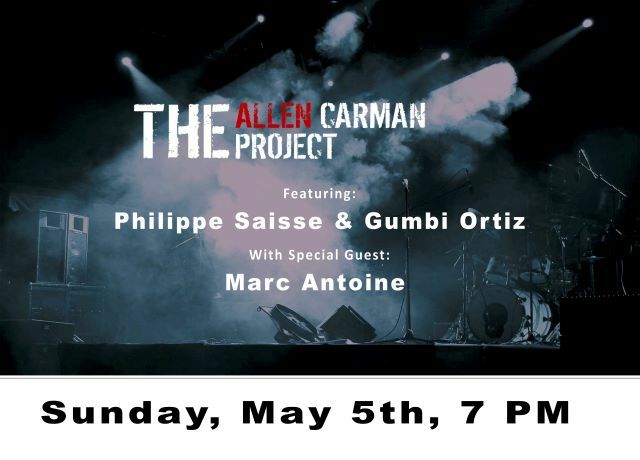 The Allen Carman Project is a contemporary jazz super group featuring bassist Allen Carman, keyboardist Philippe Saisse, percussionist Gumbi Ortiz and drummer Luis Alicea, all celebrated veterans of fusion legend Al Di Meola’s band, along with saxophonist Andy Snitzer and special guest guitarist Marc Antoine. Allen Carman has been playing bass since the age of twelve and traveled the country for several years as a working musician sharing the stage with nationally recognized musicians. In his early thirties, he put music on hold to obtain a law degree and maintain a successful law practice for 20 years. Last year, Allen decided to go back to his musical roots performing full time again, and The Allen Carman Project was born. On their debut album "Carmanology", Allen hooks up with masters of his chosen genre, rekindles his long set-aside dreams and creates an extraordinary recording chock-full of innovative sounds, infectious melodies and explosive grooves.